Rheem Pro Partner consists of highly trained HVAC professionals who are licensed, professional and courteous. We offer services ranging from furnace repair to air conditioner maintenance – and everything in between. 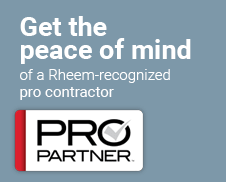 Rheem Pro Partner is dedicated to always providing exceptional service and workmanship. Every member of the Rheem Pro Partner strives for complete customer satisfaction with every job. Over the years, major technological advances have been made in the HVAC (Heating, Ventilation, Air Conditioning) field, and these advances require highly-trained professionals. That's where being a Rheem Pro Partner comes in... To provide you the experience, knowledge, and high quality workmanship that you, your home and your business deserve! We install and service quality Rheem heating and air conditioning equipment for both residential and light commercial use. Our service team, technical specialists and fleet of fully equipped trucks can answer your service needs whenever your heating, cooling, hot water, or duct system needs repairs, or service. We PROMISE to listen and respond to your specific home comfort needs. We PROMISE to sell only what you need and want. We PROMISE service integrity aimed at providing only the work and parts necessary to achieve your desired comfort requirements. We PROMISE reliable advice, professional proposals, and plain-spoken explanations of our work and products. We PROMISE on-time service at a fair price every time. We PROMISE to respect your property and peace of mind by ensuring clean, safe, courteous working procedures and clean-up practices. We PROMISE to keep your comfort, needs, and satisfaction well ahead of ours. Your best result is our goal. Hannabery HVAC is a licensed Heating and Air Conditioning dealer and is recognized as a Rheem Pro Partner. Let a Rheem Pro Partner impress you today!